Whether you are just in the initial phase of your search engine optimization work or have been doing it for so long, it is no coincidence that some areas of your website can show marked improvements. In today’s White Hat SEO practices from the many small-scale business websites, it is rare to see perfection from a disciplined process in implementing proper SEO. Search engine optimization has become a pillar of success for any site including local and small businesses. However, getting lost in so many details is quite common -- before working on the basic yet important steps are done. This means for the majority of businesses have the chance to rank at the top, but without a few growing pains here and there. Technical SEO can give you a scare, but don’t let it. Making wise decisions and rest assured that your website hosting and software will have all of this taken care of. Choosing a search-engine-friendly CMS, or content management system such as WordPress will keep your SEO efforts technically sound and secure. Deciding what’s best for your website by doing so will save you much time from optimizing the site manually. Knowing what your customers want is the very basic, but the ever-important foundation that good SEO is built on. This is one important step not only to make your rankings better in the organic search results but also to persuade users to click on your website. A well-structured content is yet another method by which we can help both users and Google understand your business and website. Called site, search engines can understand if it’s well-defined and gives us individual pages for every location and service that can be optimized. This part is where all the work is tied together. Your list of keywords are now ready and can be used on your site’s well-structured pages. Ranking factor studies are inclined to display the page title as the single, most dominant on-page ranking factor. However, page titles are also seen of like a headline since they often appear in the search results. Optimizing for clicks is as equally of priority as it is for ranking. Sadly, meta descriptions are always neglected because some believe that they don’t straight out influence rankings; but on an SEO perspective they serve as ad copy in search engines -- the description helps reinforce and establish the message in your title page, which, can help you generate more clicks. With page content, there’s plenty of room to work with keyword variations where necessary. Make certain your content is easy to read and understand -- it will appeal to your target audience. A content stuffed with keywords is usually boring and can drive a reader away from your site. Always remember that readability should always come first. Another thing to carefully think about is to optimize your internal links. Begin with your initial navigation but don't forget to use links in your content. By doing so helps improve your SEO; it also helps navigate users where we want them to go. Owners of small business owners can reap from location pages and interlinking service. Traditional SEO is also practiced by many local businesses, mainly with the help of citations, and Google My Business. GMB, or Google My Business, is a business directory. A business owner can give information to help gain visibility in the search results and on Google Maps. Providing all of the important information about your business and its contact number/s, business location, website, type (category), opening hours, and such. You may also want to include reviews, posts, and a medium on which customers can send messages to contact you. If you’ve only started your business, a basic, one-page website can help. Needless to say, this is a powerful platform and you should make sure all information is complete and up-to-date. Basically, citations are a local business’s mention of its name, location, and contact details. There are times citations are linked; sometimes not. Most often than not they are seen on social networks, websites, and local directories. In SEO, citations play a role in helping potential customers in finding local businesses and can have a positive effect on search rankings. One good method to recognize the important citation sites is to search for your keywords in Bing and Google. Once you see them in directory listings, it simply means it’s a valid citation source. Not only does adding your business site to the local directories helps with SEO -- it certainly helps customers find your business. Remember to provide only correct details about your small business when adding it to online directories. 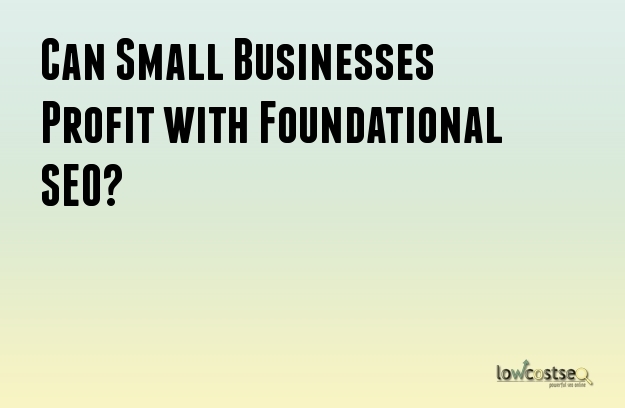 When adding your small business to an online directory. Also make sure it is in the correct category along with a business description which includes your location, services and of course, your business site’s main keywords. Authority and link building are the most complex and maligned parts of SEO. On the whole, search engines still utilize links to help understand the linked authority of sites and web pages. However, in local businesses, others use business category, address, and location distance to the user. As a small business owner managing a website using SEO, you still require links, but it’s just wise to look at the easiest first. It’s still best to focus on building links to resource pages on a directory listing, or a popular site. For many, search engine optimization is never an easy task, including small businesses. It can be difficult to know which you should work on first, so it will deliver results. Optimizing a small business takes time. If you study and apply the initial efforts on the SEO basics discussed here, you will get the best results with only less effort.